PHOTO FEATURE: Helicopters buzzed overhead, flags lined the Norwegian capital’s main boulevard and military guards stood at attention as Norway’s monarch rode in his vintage Lincoln Continental with the top down from the Palace to the Parliament on Monday. The sun was shining brilliantly, and fanfare replaced political quarreling when King Harald V arrived to open his country’s 162nd parliamentary session. It’s a highly formal and traditional affair, and the only day of the year when the monarch is allowed inside the building where the people have the power. Here he is, arriving at the main entrance, followed by Queen Sonja and Crown Prince Haakon. 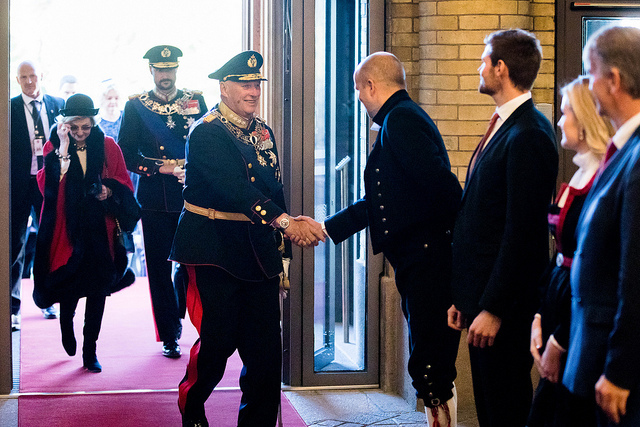 King Harald was met this year by the Parliamentary delegation from Hedmark County. Marit Nybakk, a veteran Member of Parliament who retired this year, explained that the counties (fylker) take turns, in alphabetical order, welcoming and escorting the royals into the Parliament known as Stortinget (which literally means The Big Thing). 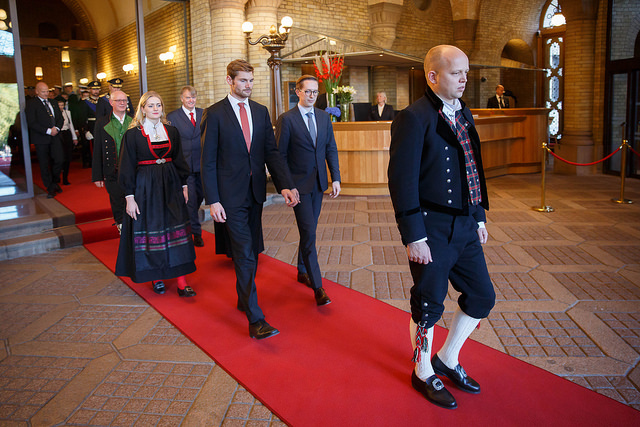 It’s at least a very big deal, and the leader of the Hedmark delegation who also leads the Center Party, Trygve Slagsvold Vedum, donned his national costume known as a bunad for the occasion. Vedum is known for his laughter but took his ceremonial role very seriously as he then led the royal entourage. Or perhaps he was inwardly seething after learning that he likely won’t be able to reverse regional reforms that will merge county governments after all. His hopes that the Christian Democrats would back his efforts have reportedly been dashed. 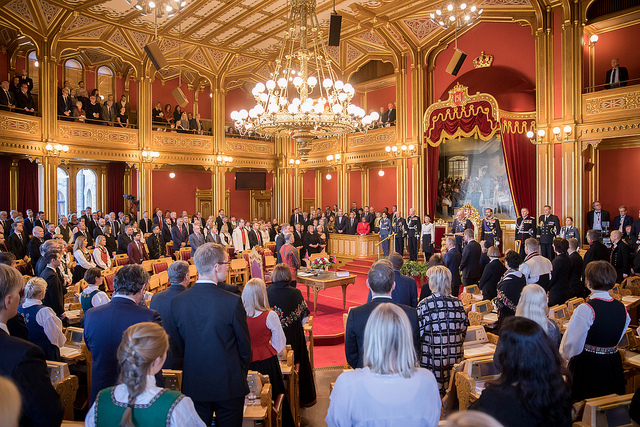 Once inside, the formalities began with all in attendance singing the Norwegian version of “God Save the King” before Prime Minister Erna Solberg handed her government’s trontale (literally, the speech from the throne) to the monarch.He then read it aloud with everyone standing. It summarizes the government’s priorities for the year ahead and started off by stressing how fortunate Norwegians are to be living in an affluent democracy. It also noted, however, that Norway’s “golden years” of rising wealth are over, with revenues from the country’s oil industry set to decline. That in turn can lead to a tighter state budget, due to be presented on Thursday. 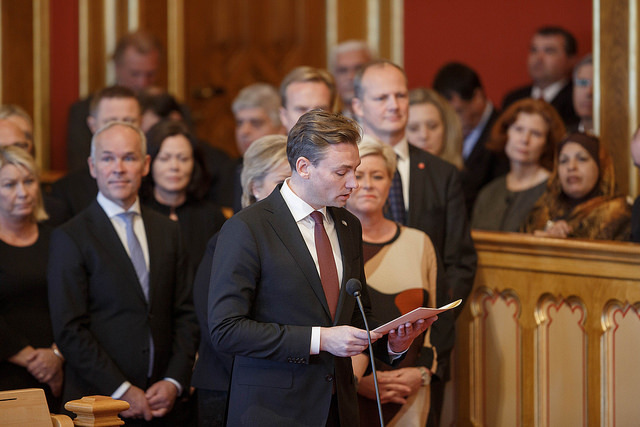 Then came the government’s equivalent of a “State of the Country” speech, traditionally delivered in nynorsk (one of Norway’s two official languages) by the youngest member of the government. This year that was Henrik Asheim, standing in for Education Minister Torgjørn Røe Isaksen who’s on paternity leave. Government ministers stand at attention throughout the entire opening ceremony. In the background, the section reserved for foreign ambassadors to Norway. The embattled president of the Parliament, Olemic Thommessen, seemed to thrive amidst all the pomp and circumstance of the opening ceremony, unaffected by turmoil that has surrounded him in recent months or by the fact that he faced historic opposition to his re-election over the weekend. 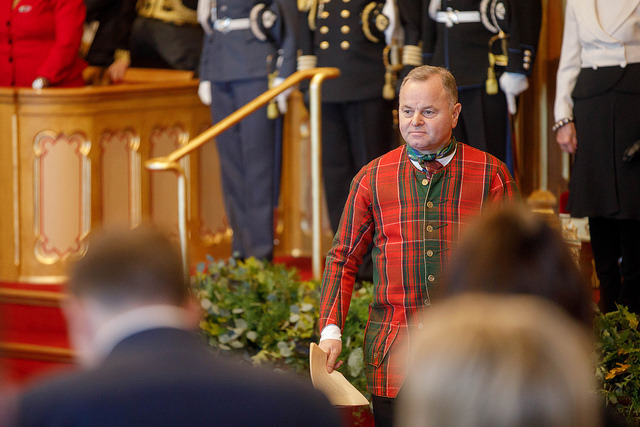 Some politicians claimed the controversy around Thommessen was getting the parliamentary session off to a bad start, but Thommessen carried on, wore his own bunad as usual and noted in his remarks that the Parliament shouldn’t just be full of confrontations. He led the assembly in singing the first verse of Norway’s national anthem, the king left the building, and political debate was due to resume immediately.